Some call it a hobby and others call it earning a living; being a “Picker” is exciting and can really be rewarding! Pickers are constantly researching and learning about antiques and collectibles and honing their skills. I have written many articles right here on my crazy4me blog sharing tips with my readers about selling online, selling at antique malls, buying and selling at flea markets, antiques and collectibles shops, thrift stores and today I am sharing tips on being a Picker. An exceptional resource that is equally good for the novice picker or experienced picker is the Picker’s Bible: How To Pick Antiques Like the Pros by Joe Willard. 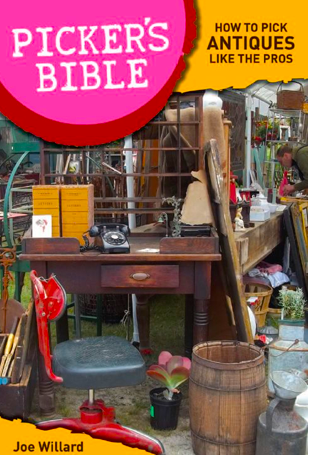 The Picker’s Bible teaches all you dumpster divers, estate sale addicts and modern archaeologists tips and tricks to succeed as a Picker and it is a fun easy read that will get your “Picker’s” juices flowing!! I would like to share with you all my top 5 tips for the novice Picker. 1. Research. If you follow my blog then you know I am always touting the term “Research” as the more you know about a variety of items the better Picker you will be and the better Seller your will be. You need to know what items are collectible, what items no one really want and what items to specialize in. 2. Getting Dirty. Don’t be afraid to get dirty. Sometimes you have to crawl around in an attic, basement, or out-buildings to Pick the treasure. No one said Picking was easy. Heck, even at flea markets and garage sales you will find dirty or grimy items, items in need of TLC. Also, don’t overlook dumpster diving especially when you see someone is moving or being evicted (good idea is to check to make sure you have permission from the people or landlord to go through the dumpster). 3. Learn to Negotiate. You must be respectful of other people’s stuff….they are attached to their stuff so if you want their stuff you need to learn how to negotiate. Remember “He Who Speaks First Looses” so you need to learn to get the owner of the stuff to first let you know if its for sale and then how much they want for it. 4. ReSelling. Pickers pick as a business and must have a way to off-load the merchandise. Make contacts with thrift shops, antiques shops, decorators, designers, dealers (jewelry, coin and stamp), flea market vendors, online sellers etc. You can re-sell to these folks and charge a commission. Once you develop a reputation for sourcing or Picking great merchandise you can certainly make a steady and very profitable income being a picker, re-seller or personal shopper. 5. Business. Make sure you talk to a lawyer, CPA or account to get setup as a legal business with your state and learn all you need to learn about running a business as being a Picker is very hard work, demands many hours, and you don’t want to over-look any legalities.